OMG the cold winds of May have totally taken Chicago by surprise this month. Just after I’d planted all my pepper plants and all my tomatoes, we get a frost advisory with temps expected to dip to 34-36 F! What to do. Well…I decided to go ahead with the cloches I’d been planning all along but I didn’t have enough for all the plants so then plan B was born: pup tents and hoop houses. AND this is the insane part: I’d been putting this off for a year because I thought it was hard. Yeah, lame. I know. It’s so easy I coulda done it myself except that I needed to man the camera, therefore needing a model. Here is handsome Pete, presenting the finished Hoop Hut and Pup Tent. The photos that follow show close ups of how we did this. Just click on them to enlarge. This is a hoop approach not designed to be permanent because it’s not tall enough to stand under, doesn’t have proper ventilation, weighted sides or doorways. But it’s perfect for a 2-week cold snap here in Chicago. It’ll keep things cozy and then I can remove it come end of May. 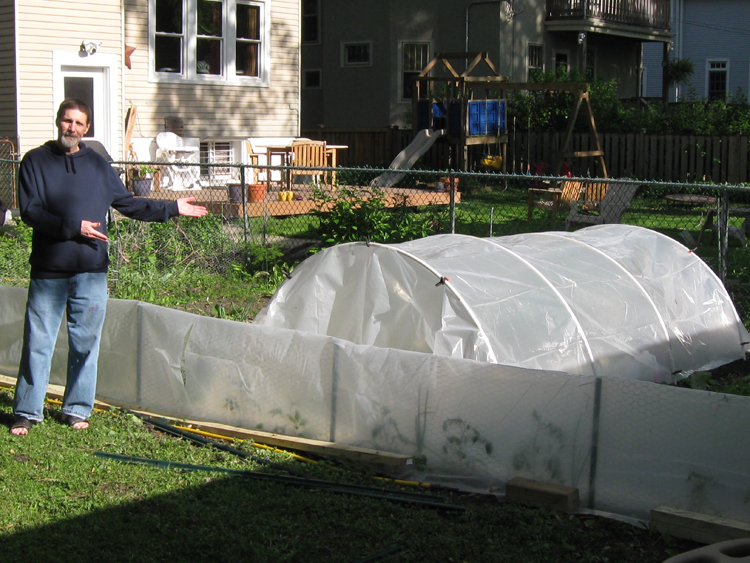 So this isn’t really a hoop house, it’s more like a hoop hut. Oh, one more important note: CALL BEFORE YOU DIG FOLKS!!! Pushing rebar into the ground means ensuring you’re not disconnecting your electricity or puncturing your gas line. 1 sheet visqueen measuring at least 10 foot by 15 foot. You’re going to use 1 rebar per end of each PVC=8 ends on 4 PVC. 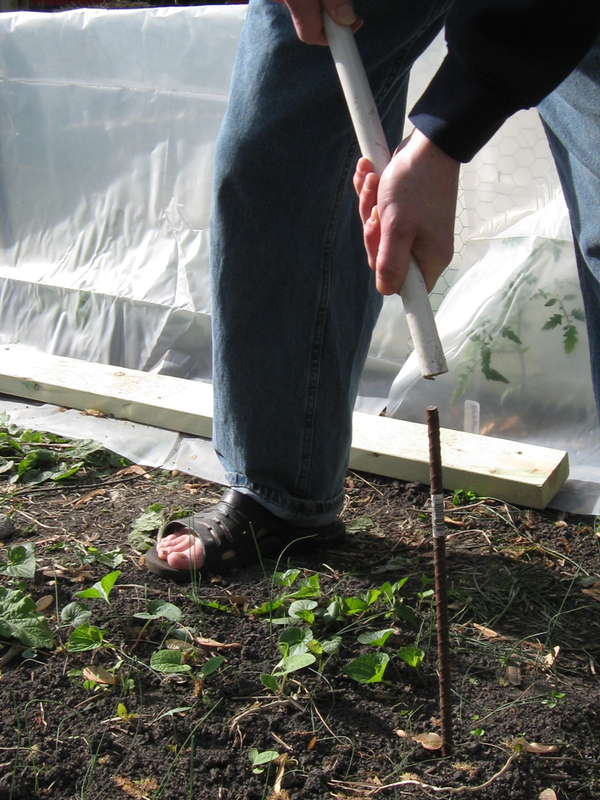 Measure out where you’re going to place the rebar and ensure they’re no more than 3 foot apart down the side of the hut. Of course your hut is 5-6 foot wide. 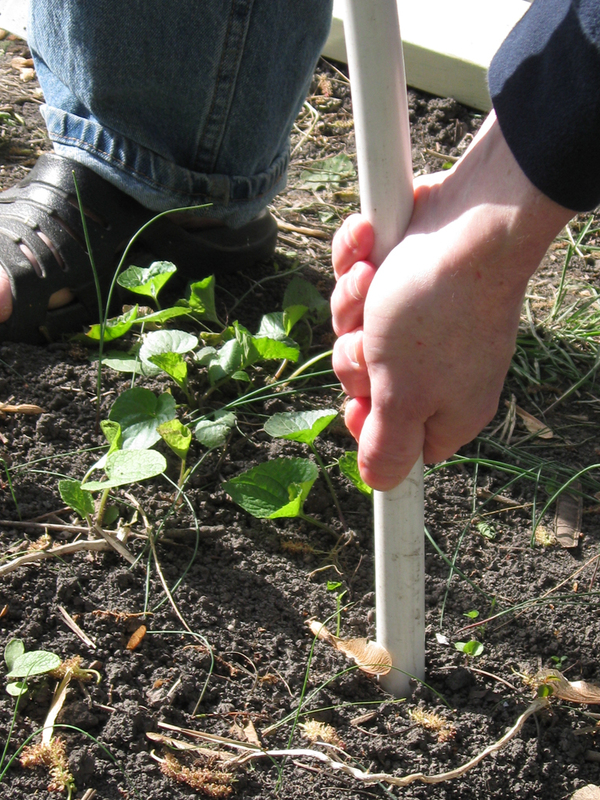 Make sure they align across from each other, on either side of the garden row you’re covering. In my case, I covered two rows. Pound the 8 rebar vertically into their designated locations to a depth of about a foot. Doesn’t have to be perfect, just deep enough that they won’t fly out of the ground and kill someone if the tension of the PVC gets the better of them. Then, nestle one end of the first PVC pipe over a rebar. Bend the other end slowly towards the opposite rebar and firmly, gently, guide the end in place. It will feel taught and that’s normal. But you should probably wear goggles just in case. Do this for all PVC and rebar. When bending your PVC toward the rebar sticking up from the ground, 2 things are critical: make sure you’re using 2 foot rebar pounded 1 foot into the ground AND you don’t bend your PVC so much that you break it. If the rebar isn’t embedded deep enough, you could end up with PVC flinging rebar in all directions, possibly breaking a window or impaling a neighbor. Push the PVC gently but firmly over the rebar. Push the PVC all the way to the ground. Don’t let it meander up and down the rebar. Once all are in place, survey the work and adjust if any are totally out of whack. Remember, it doesn’t need to be perfect. This isn’t a Picasso, it’s a hoop hut. You can see approximately how high this hoop hut is going to be by the handsome model standing nearby. Also notice the spacing of the PVC and that it covers two rows. Next, you’re going to gently spread the plastic over the hoops. Do have a second person help, it goes faster and on a windy day, you’ll need more hands. Spread it roughly to ensure you measured correctly. Mine is a tad short on the sides. I should have an extra foot on each side to anchor the plastic to the ground but I didn’t have enough. So I’m calling this ventilation for now. Securing the plastic to the hoops can be done several ways: weighting down by attaching running boards along the sides or using cheapie hardware clamps from the dollar store. We opted for the latter because it was easy, cheap and uber temporary. Of course, if I want to make this a permanent structure, none of these rules apply. Using clamps like these is easy and cheap. Of course, I’m not sure yet if it will withstand the gale-force winds that Chicago is known for but I’ll keep you posted. Another quick-fix temporary solution to unexpected frost. 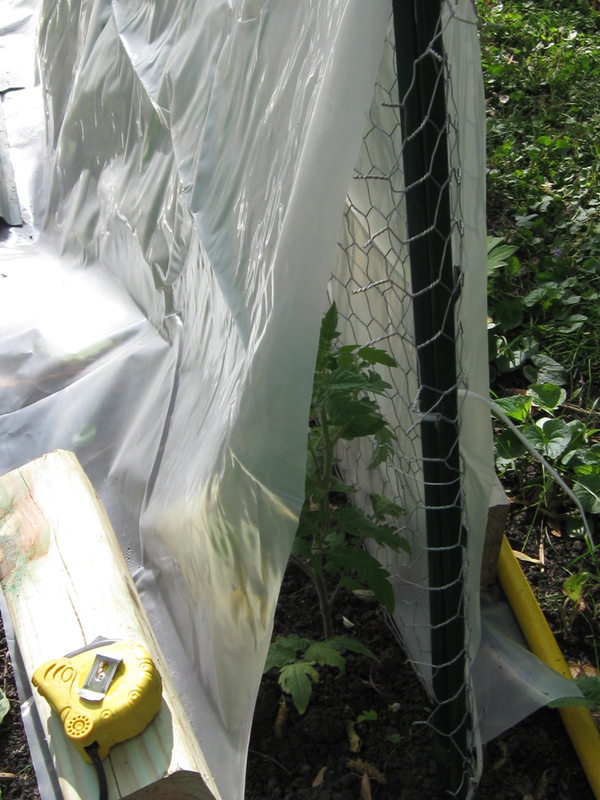 Luckily I’d planted my tomatoes along a 2-foot high chickenwire fence this year so was able to use the fence as support for tenting visqueen over them. Easy to do, just weighted down the ends with scrap lumber and t-posts. Old shoes or dead bodies would work too. And I purposely didn’t make it air tight because I didn’t want them to smother in the sun. It’s odd up here right now, bright sun but 50 degree weather. Even in 50F with a breeze, a bright sun can cook seedlings if ventilation is nonexistent. 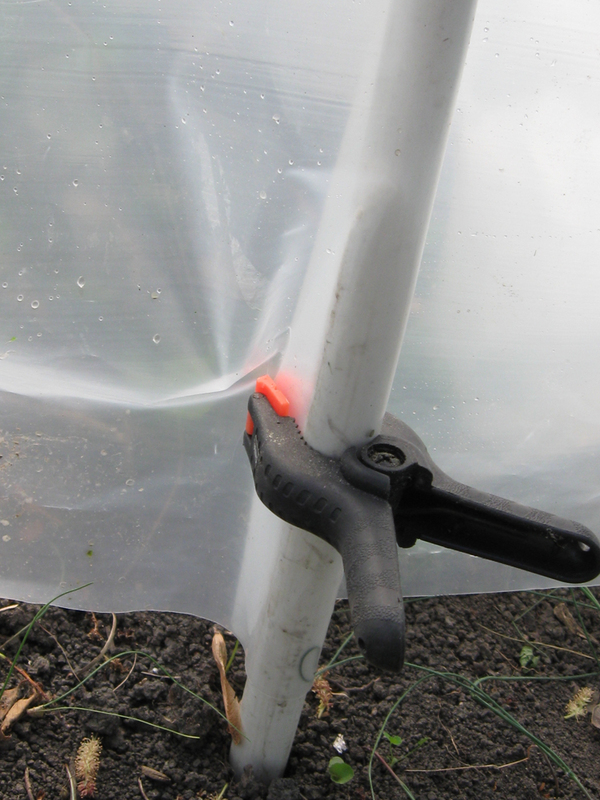 Gently drape your plastic over the fence, using the fence as a vertical support. 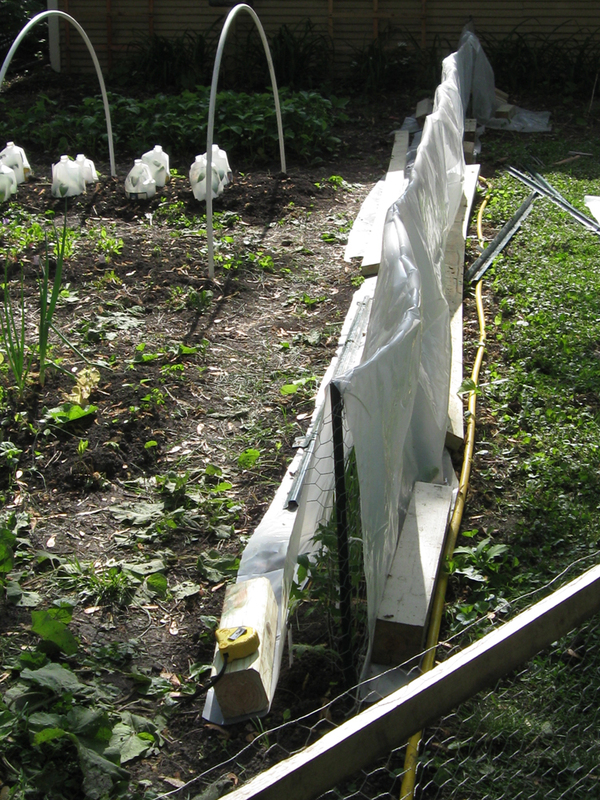 You could also do this using t-posts and crosswire exactly as if you were pitching a tent over your plants. You can see that we pieced together several scraps of plastic thus creating ventilation to prevent plants from being cooked. You can use just about anything to weight down the sides so the wind doesn’t take off with your tent. We also left the ends open, again for ventilation. The great thing about both of these approaches is that they’re temporary: can be disassembled and put away until fall. 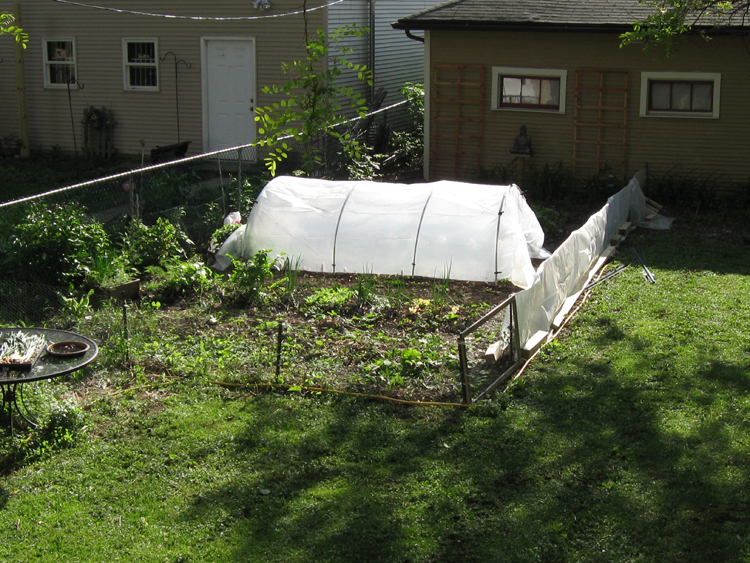 But what I’d really like to do is come up with one hoop house that’s a proper house. 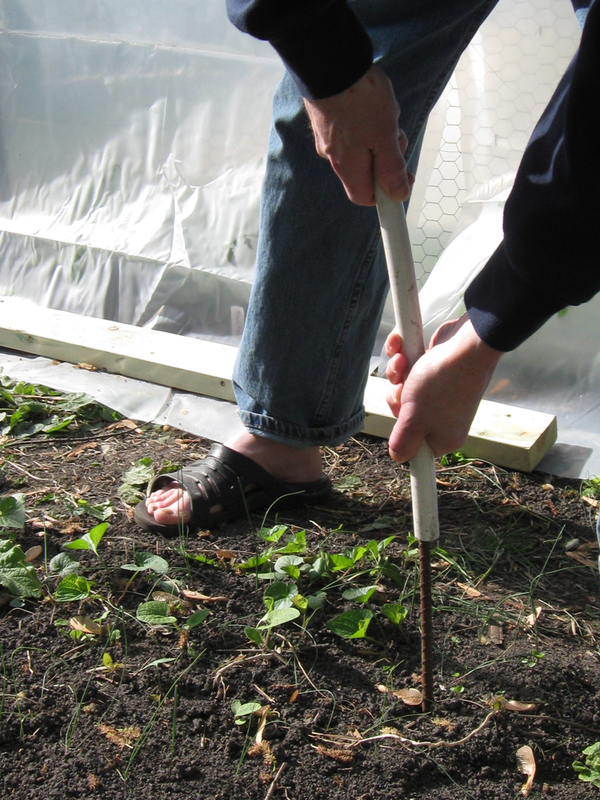 Tall enough to walk into in December to harvest cold-weather veggies and winter greens. But until then, this will do. UPDATE: I have turned off comments for this post because for some reason it has become a magnet for spam. No other posts on my blog have this problem so I’m not sure what’s up with that. Sorry for the hassle. This is so clever – but more than that I am pleased to learn that southern England is not the only place having cold weather in May! WE had a frost warning last night. Yes indeed, it is still cold today. I’d love to turn on my little space header under the desk but it will blow a fuse. Perhaps there’s some sort of interior, thermal hoop hut to keep us warm while working at our desks? not a bad idea. we had a frickin’ SNOW STORM in dallas, back in march, after i’d planted everything. i didn’t have enough time to do something this big, but floating row cover held down with the metal plant markers and other random weights was enough to defend my babies against the one day. this would DEFINITELY have made it easier to plant during our weirdly cold late winter/early spring, though. i’ll have to bookmark it for next year! i’m in eastern pa…my yard looked like a shanty town for two nights…every snowman or christmas tree flannel sheet in the house was draped over my little babies…whatever works! How clever. This gets my stamp of approval. Is there anything rebar can’t do? I say, “no”. And that’s why I always keep some reserves on hand. 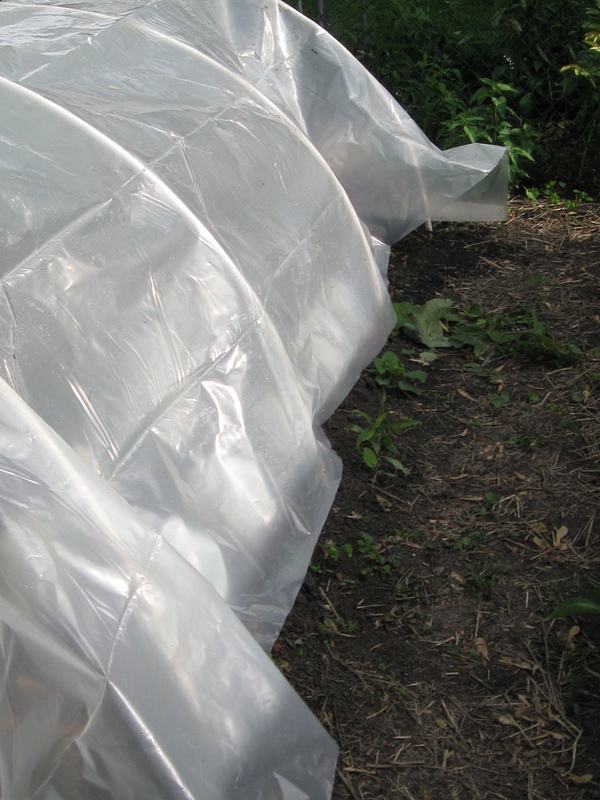 We’re using giant plastic liners (from the 1,000 lb. boxes we pack salmon and herring in) over our repurposed shipping crate raised beds. The veggies up here in Sitka, Alaska seem pretty pleased. Post photos after the deer come! Seriously that’s what happened to our backyard garden. Devastated. That’s that old Mother Nature thing. I have railed against her on my site so often I have a friend that was blaming me for our cold May. He’s since decided maybe it’s not all my fault. But I’m with you on the plant protection – I gave in this year and got a little pop-up greenhouse for my tomatoes and peppers. I plan to plunge forward and buy plants this week. Normally we don’t dare do that until after the first of June. Nice, simple. Up here in Alberta we’ve still got snow on the ground in some places — just had a big storm last week. Those who were on top of things and got cool weather crops in the ground will make out like bandits in a couple of weeks. The rest of us. . . WAY too cold yet for us to even consider tomatoes or peppers. happy growing! wow! what a brilliant idea… thanks! Like your design. We were thinking of conduit-bending, but this is much simpler. 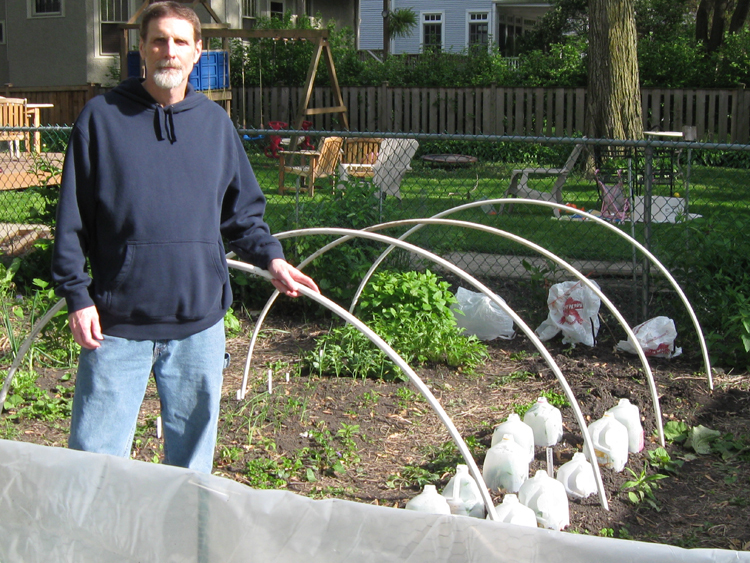 I have heard that hoop houses in the Chicago area are able to grow greens through most of the winter here. While still only a zone 5, we do get some rather frigid cold winds. Something you may want to try some day but make them large enough to walk into so you don’t lose too much heat in January. We don’t have any deer in Chicago, that I know of anyway. An occasional cougar or coyote maybe. Our big issues are squirrels and rabbits. Rabbits all but devoured my blueberry bushes this past winter. Yes, I love rebar like I love duct tape. Can have too much of them lying around. 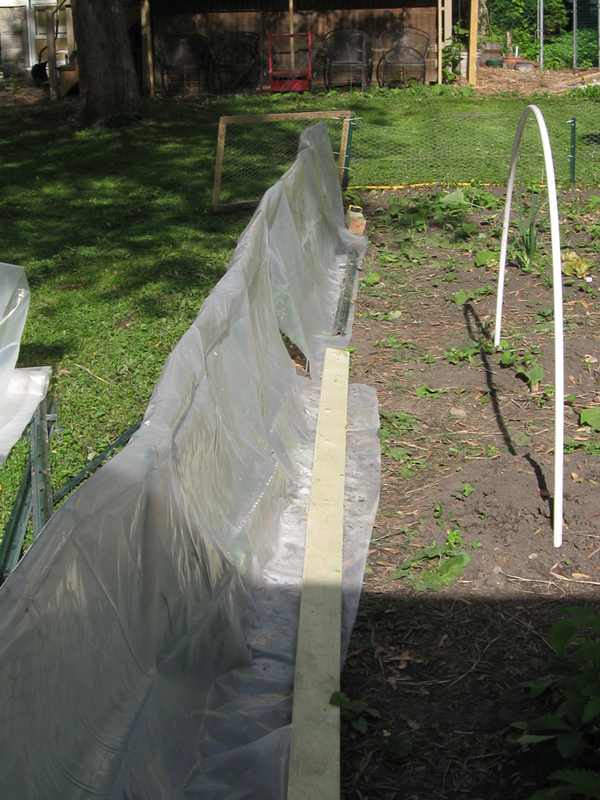 I thought about floating row covers but I wasn’t sure it’d be enough for the peppers. They really took a beating the first night it got down to 47F. You should totally post photos of your veggie shantytown! It reminds me of the time a friend took her cousin to a Halloween party and he wore a flowered sheet as a ghost. Thanks everyone for your feedback and don’t forget, plants can’t get any water under plastic so either don’t keep them there forever or take a hose to them occasionally. Hoop hut!?!! you take your garden work seriously! I do admire you, I have a back garden, and even weeding to me is too much hassle…no green fingers here I’m afraid…. Didn’t you see all my weeds?! I hate weeding too. That’s why I usually just decapitate them with a hoe whenever I think of it. Much easier. Unless the lily of the valleys are growing somewhere I don’t want, then I yank those out and it’s like pulling basting thread from a quilt. anyhoo…check out this 3d barrel growing….tempted? I think it’s just very good……. Love your hoop hut. How well did it hold up? and where did you purchase the rebar and clamps? We set up this hoop hut to be temporary just to get the seedlings through an early spring. It held up ok though the clamps didn’t hold on all sides through Chicago’s winds. If you wanted something permanent, I’d def not use clamps. The rebar can be had a Menards in the fencing section. The clamps were from the dollar store. I did buy the heavier weight plastic so it wouldn’t tear.